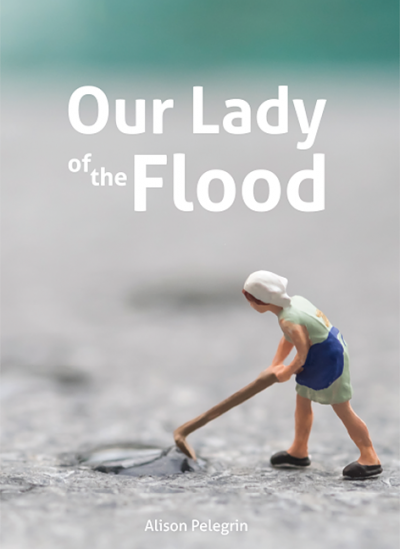 Our Lady of the Flood, the title of Alison Pelegrin’s new chapbook, might suggest a collection of poems related to the Blessed Mother in the Catholic tradition. One joy of reading this book is Pelegrin’s ear for rhythm, sound, and sequence. Her natural speaking rhythm gives her poems a pleasing “mouth-feel” when read aloud. The poems are brief; most are less than a page and are made up of short to medium-length lines gathered traditional couplet, quatrain, or column forms. Powerful narratives and sharp imagery draw the reader in. is no silvered mirage. It clings like tar. Bsided: You mention attending Catholic school as a child and seem well-versed in the lives of the saints and Our Ladies, but there are also Buddhist references. You have been through the kinds of natural disasters that make even atheists start praying. I am wondering if you uttered some prayers and to whom or to what were they offered. AP: I did attend an all-girls Catholic high school but was born, baptized, and continue to attend the Episcopal church. My practice and understanding of worship is broad, and some of my best experiences have been in ceremonies with people of all faiths, including a mandala ceremony at the Bogue Falaya River with Buddhist monks. I think coming together is more important than any specific group or creed. The majority of my prayer life takes place in my head, in the form of a constant monologue, though I also take great comfort in the liturgies from The Book of Common Prayer, and also Taizé hymns. Many poems, to me, are prayers. Praying over hurricanes is hard–I don’t expect them to disappear, and I don’t want to pray that the storm hits someone else instead of me. Some people pray to Our Lady of Prompt Succor–protect us from hurricanes and floods. That doesn’t ring true for me, so I pray for things like safe travels, that the people in the storm’s path heed evacuation orders, that they make arrangements for their pets, that families stay together, that first responders stay out of harm’s way, and that in their continued recovery they may encounter honest, fair, kind and loving people. Bsided: I know you are now living in Covington, which my atlas shows as a little north of Lake Pontchartrain. What was your experience of the 2016 floods—did you have to evacuate? And during Katrina, how long did you actually stay in Mississippi or wherever else you landed before returning? AP: For the 2016 floods (60 miles to the west of me) I was a horrified witness, though I tried to look away, because I know what it is like to be gawked at, to be rescued from your house by a boat. I did not have to evacuate, and the closest I came to those floods was through helping with recovery and supporting my impacted students through a chaotic and stressful semester. Katrina hurts to remember; it’s the before and after marker of my life, as much if not more so than my father’s death. After Katrina we bounced from hotel to hotel in Mississippi for a month before returning to Louisiana to a rental. I cannot convey the stress–a terror that settled into crushing despair. I didn’t recognize my life, or even the street where I lived. And yet, we were lucky in so many ways–unscathed compared to others. This was never more clear than the day we left the Holiday Inn Express in Greenville, Mississippi for good. The little boy of a family we had come to know throughout our stay was waiting in the lobby of the hotel for the school bus to come and pick him for his first day of school. I will never forget the sight of him, in red sweatpants and black dress shoes, the sun bright in his face. The people of Mississippi were wonderful to all of us–they would leave open invitations in the hotel lobby so that there was always a meal. They made supply bags with bathroom essentials and peanut butter crackers; school children decorated the doors to the hotel elevator with signs wishing us well. Bsided: If you could come upon the broadside of “Quicksilver” posted anywhere in the world, where would you want that to be? AP: I would love to see my broadside posted somewhere it isn’t supposed to be, as an act of rebellion, though this isn’t a rebellious poem. Magneted to a shared refrigerator? Maybe taped on elevator door to lift the spirits of travelers facing a similar situation, as those construction paper signs lifted mine so many years ago. Kali Lightfoot lives in Salem, MA. Her poems and reviews have appeared in journals and anthologies, been nominated by Poetry South for a Pushcart Prize, and won Honorable Mention from the Science Fiction Poetry Association. Kali has an MFA in Writing from Vermont College of Fine Arts.